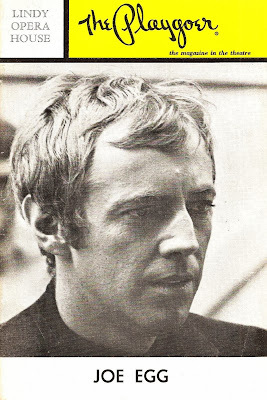 During a long and varied acting career, Noel Harrison has appeared in a wide variety of plays, ranging from comedies to musicals and serious dramas. 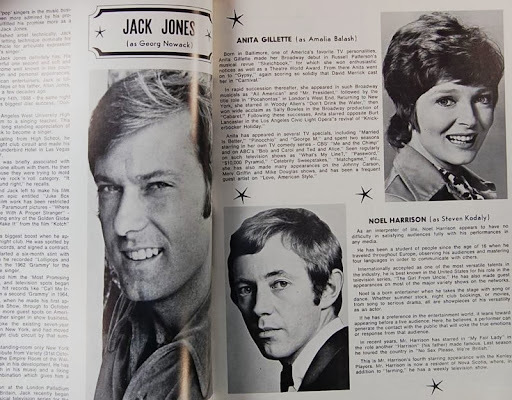 The majority of his performances have been in America where he spent many years through the 1960s, 1970s and 1980s touring the country's theatres. Notably, he played the character Henry Higgins in 18 productions of My Fair Lady - the part made famous by his father, Rex Harrison. Noel has also played the character of Arthur in 15 productions of the musical Camelot and many other notable roles, including Arthur Kipps in Half a Sixpence, Sgt Trotter in The Mousetrap, Count Von Trapp in The Sound of Music and Don Quixote in Man of la Mancha. 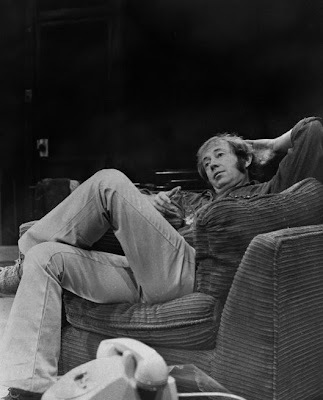 He has also directed several productions and wrote and performed in his own award-winning one man show, Adieu Jacques. 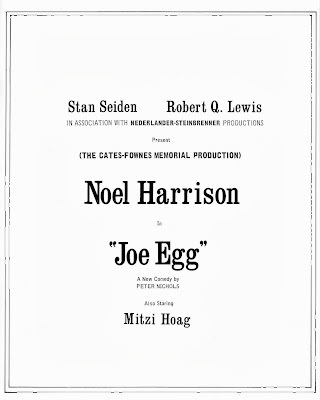 Printed below is Noel Harrison's biography as featured in the programme for the 1968 production of Joe Egg in Los Angeles. 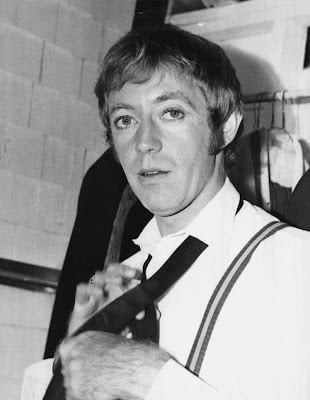 NOEL HARRISON became a star and an idol of American youth through his portrayal of secret agent Mark Slate on the NBC-TV series, TheGirl From U. N. C. L. E.
He began as a performer at the age of 17 in Ipswich, England in classical repertory. While working as an actor he also sang in small clubs and coffee houses, and soon found himself travelling throughout Europe as a cafe entertainer. In the process he learned to speak, act and sing in four languages. Since those early days he has appeared in important and diversified roles on the English stage and has also made five motion pictures. 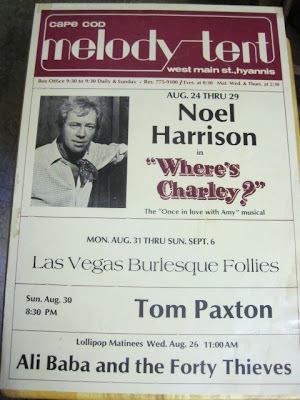 On this side of the Atlantic Mr. Harrison has performed in many major night clubs, most recently headlining at the Persion Room of the Plaza Hotel in New York. He will be all over the dials this fall on such TV shows as The Beautiful Phyllis Diller Show, the Jerry Lewis Show, Guide to the Swinging Bachelor, Hollywood Palace and others. 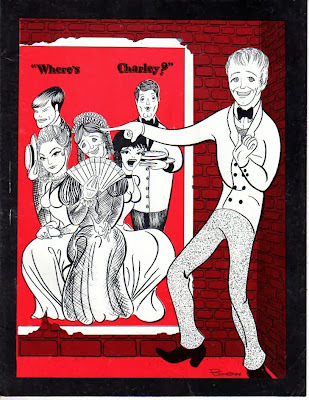 During the past summer he appeared in stock in Half a Sixpence and also re-created the now famous Ray Bolger rold in Where's Charley? on the Kenley Circuit. He has also implemented his acting career by recording four LP albums, the latest of which is the Reprise album, "The Great Electrical Experiment Is Over." It includes four of his own compositions. The son of Rex Harrison, he is the first to admit that being the offspring of a famous star can have its drawbacks; however, making it on his own has dispelled any hang-up he might have had at one time. He won the PHOTO-PLAY award for the most promising newcomer for his role in The Girl From UNCLE. He is married to Canadian-born, former London fashion model Sara Eberts. The Harrisons have four children, Zoe, Cathryn, Simon and Harriet. Also having an outdoor menagerie that includes two horses, a pair of polo ponies, five dogs, one monkey, 15 chickens, two Siam-ese cats and a mynah bird, they are currently looking for larger quarters. 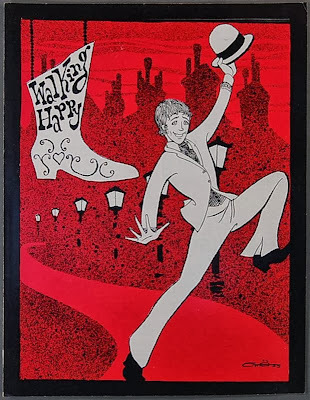 One of Noel's most common roles has been Henry Higgins in My Fair Lady - the part made famour by his father, Rex Harrison. Talking to the Los Angeles Time in 1989 about his decision to take on the part, he said: "At the time, I had no work, I'd just had these new kids - twins - and they offered me a lot of money to do it. "I thought, 'How can I turn it down?' I called my father and told him they'd offered me this job. He said, 'Why not? Everyone else is doing it.'" 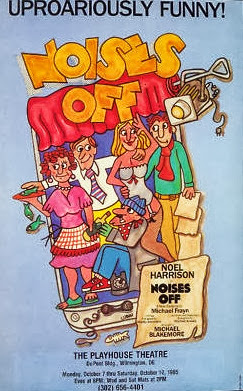 Noel first played the character in Boston in 1974. 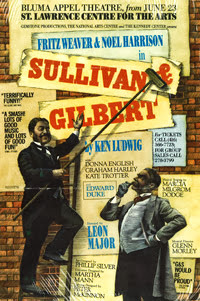 He went on to play the part in 18 productions across America. 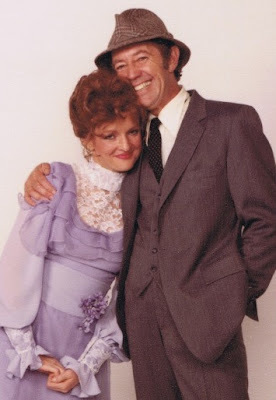 He is pictured here in a 1984 production with actress Christine Ebersole. Another play Noel has appeared in a number of times is the musical, Camelot. 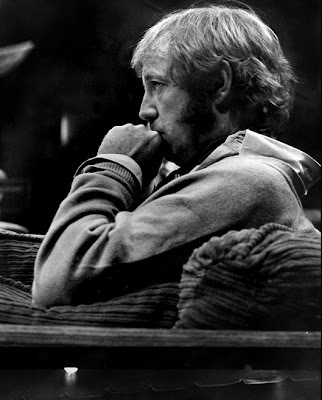 His portrayal of King Arthur in 15 productions of the show won praise in a number of reviews. 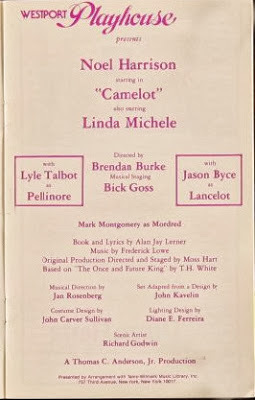 Commenting in the Pittsburg Post Gazetee in 1979, George Anderson described Camelot as a "freshly thought, sincerely felt show" and said Noel made a "touching Arthur, simple, decent and un-pretentious." Noel's work has also featured the King Arthur story on a number of other occassions. In 1991 he provided the voice for a character in a cartoon version of the story and in 1961 he made a record for children of the story. 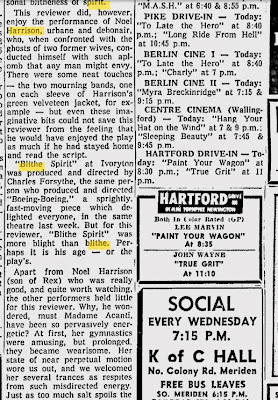 Ralph Hicklin of the Telegram called the play "compassionate . 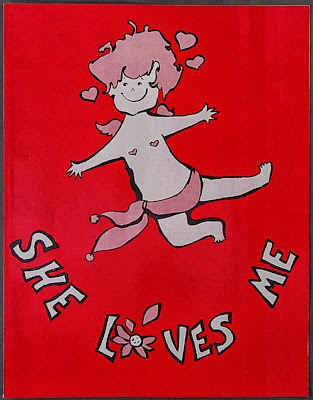 . . often beauti-ful and vastly clever." 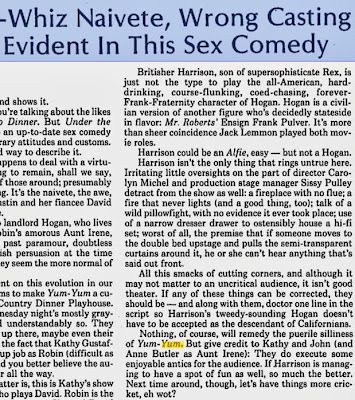 He said Harrison's performance was "at least serviceable." 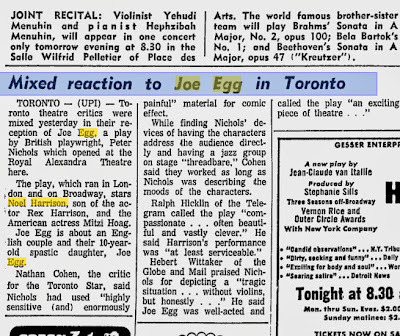 Hebert Wittaker of the Globe and Mail said Joe Egg was well-acted and called the play "an exciting piece of theatre ." 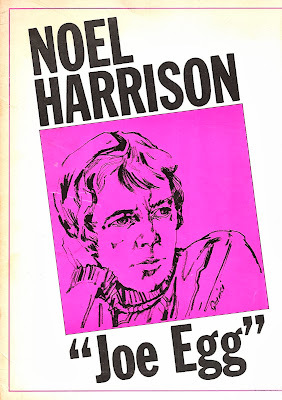 Chicago Tribune: " Noel Harrison is excellent and easily real as the troupe`s beleaguered director.it`s about as engaging and unforgettable as comedy can get, a goofily funny bit of nonsense that every now and then touches on a poignant kind of poetry." By BOB NAUTA — Noel successfully portrays the role that his famous Father; Rex Harrison, created in the classic film version. 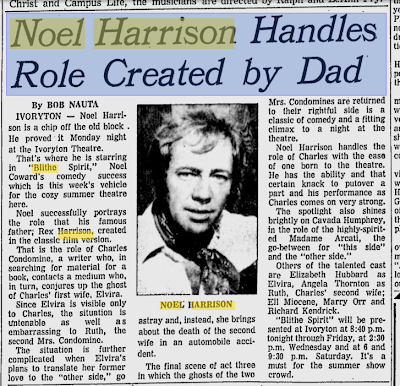 Noel Harrison handles the role of Charles with the ease of one born to the theatre. He has the ability and that certain knack to put over a part and his performance as Charles comes on very strong. It's a must for the summer show crowd. 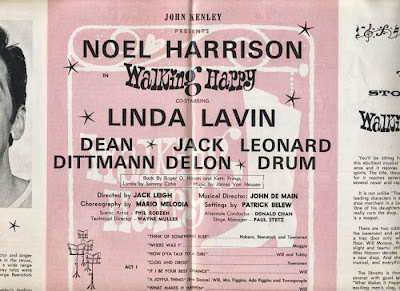 Apart from Noel Harrison (son of Rex) who was really „ good, and quite worth watching,i-the other performers held little for this reviewer. Britisher Harrison, son of supersophisticate Rex, is just not the type to play the all-American, hard-drinking, course-flunking, coed-chasing, forever-Frank-Fraternity character of Hogan. 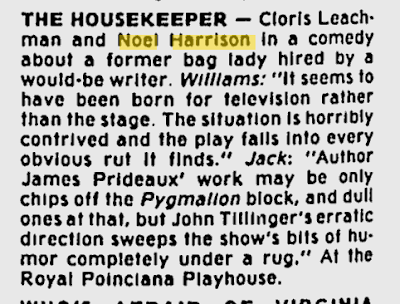 Los Angeles Times in 1992: "Noel Harrison sketched in an oddly low-profiled Lord Chancellor, but managed his patter with reasonable clarity and security"
THE HOUSEKEEPER "It seems to have been born for television rather than the stage..
British actor-singer Noel Harrison has been retooling and touring this splendid tribute to Brel. Harrison plays guitar and sings in a beautifully rough voice as he introduces us to the artist. leaving us with an enduring understanding of the late singer's emotional depth.